DES Architects + Engineers (DES A+E) just completed the Moffett Place High Garden — a two-acre rooftop park — in the heart of Silicon Valley. It is one of the largest elevated parks ever completed in the region. DES A+E designed the High Garden to transform what would ordinarily be an underutilized parking deck into a green oasis. 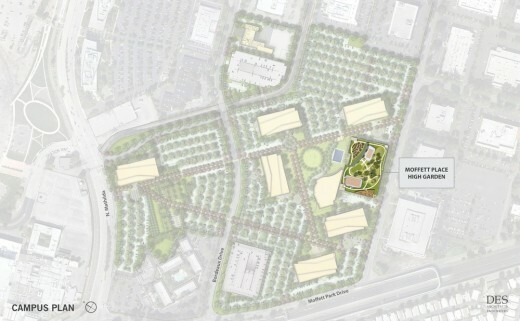 Instead of 250 parking spots, it has two-acres of greenspace. 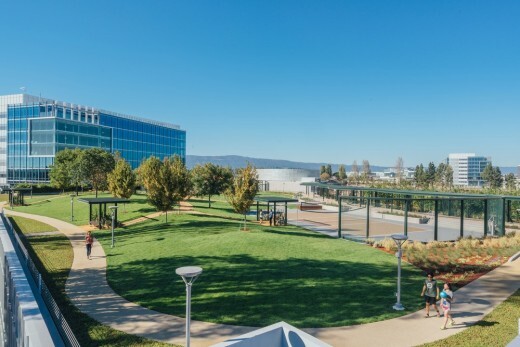 The park is one of the central amenities to the Moffett Place campus, which was recently leased to Google in its entirety. 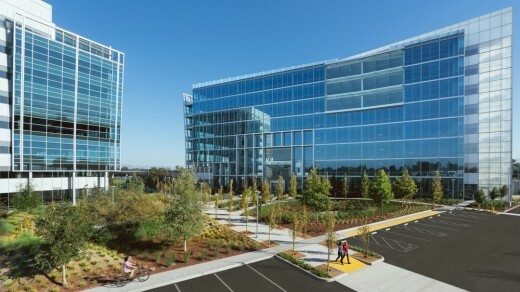 The campus is the 2nd largest office project under construction in Silicon Valley. Covering the top of a two-level parking structure, the High Garden is a departure from typical rooftop gardens in that it provides recreation opportunities for up to 650 users. 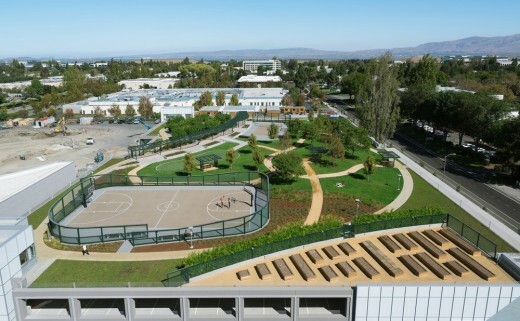 It integrates active uses with basketball and volleyball courts for team sports. Passive uses include a community vegetable garden and a meditation garden complete with meandering rows of bamboo. 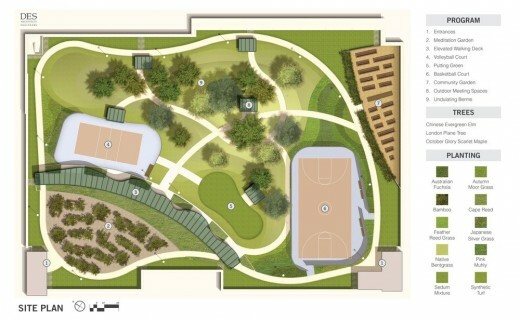 Whether playing an afternoon pick-up game, walking with a co-worker, or meeting outside amongst the trees, the design intends for visitors to use the park. 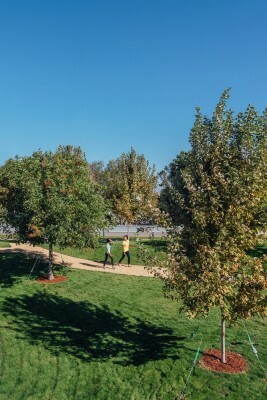 An elliptical running track loops around the park’s perimeter doubling as the main means of circulation and usable fitness space. With visitors raised 30 feet in the air, the path draws people towards the roof’s edge and showcases the views of the adjacent preserved heritage trees and the Santa Cruz Mountains off in the distance. 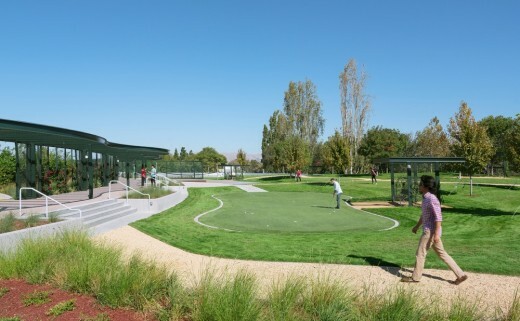 Branching off from the running track, a raised walking deck bends in towards the park’s center and leads visitors to a sequence of experiential settings including a putting green, volleyball court, and a large greenspace. The greenspace is inspired by the local Peninsula hills with undulating berms and tree groves. These natural features add spatial definition and a sense of place. Criss crossing through the greenspace, gravel pathways connect people to shaded seating areas that provide sheltered work spaces. 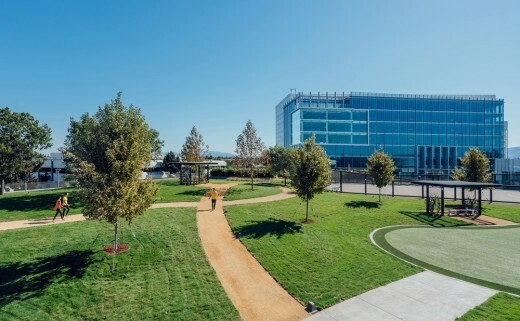 Alternatively, the open grass areas brings flexibility, acting as an amphitheatre for company events or simply as a space to lay out a picnic blanket. Native and adapted grasses, shrubs, and vines — about 20 different species — celebrate the diversity of the California landscape and reduce irrigation needs. Particular plant varieties, including Cape Reed and Feather Reed Grass, attract beneficial insects and birds while providing food and habitat. Where irrigation is necessary, reclaimed water is used exclusively resulting in no impact on potable water supplies with the exception of the vegetable garden. The rooftop also contributes significantly to improved stormwater management and reductions to the heat island effect. 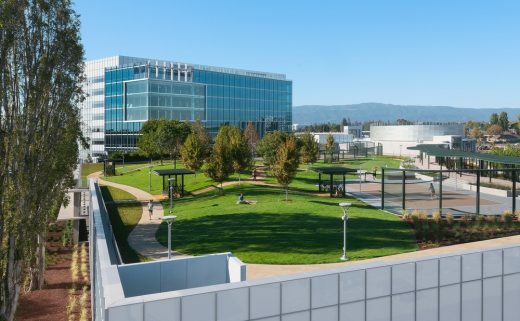 Connecting the High Garden to the campus, the background landscape — adjacent trees, office towers, and mountains — is incorporated into the composition of the garden and provides a layered experience for the users. From within the park, you are visually connected to the campus and the surrounding natural environment. 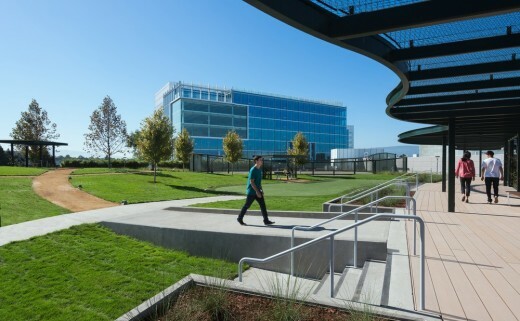 From the nearby office tower, large sweeping gestures such as the elevated walking deck and the radial organization of the community garden provide visual interest. The High Garden is a place where campus users can separate themselves from the workplace while still feeling connected to the greater landscape. 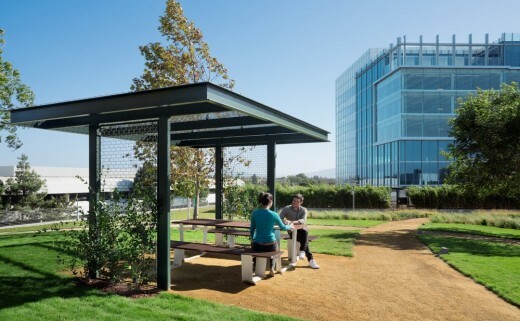 The High Garden introduces a healthier, greener landscape model for corporate campuses as it provides a new place for people to connect to one another and the environment. 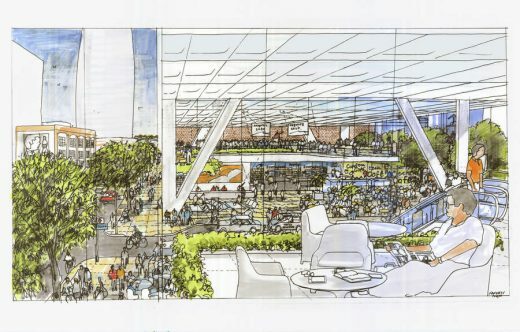 Since the concept has proved successful and attractive to tech employees, DES A+E is currently designing four additional rooftop parks, the highest of which will be raised nine stories in the air overlooking the San Francisco Bay.